Watch a video clip about castles. A quick guide to castles. Zoom through a recontruction of a medieval castle. Watch a video clip that explains important castle features. Find out different ways castles were attacked. Watch a video about how to destroy a castle wall. Things to make and do about everyday castle life. Take a video tour of Hampton Court Palace. See inside Windsor Castle, the oldest occupied castle in the world and one of the official residences of Her Majesty The Queen. Watch an actor describe life as a medieval chef, creating the finest desserts for important castle guests. A humorous yet historically accurate look at life in a thirteenth century medieval castle. Inventive embedded flaps on page allow children to explore the hidden world of the castle. Young readers are taken on an exciting journey in which they encounter a magnificent banquet, a thrilling tournament and a dramatic siege. David Hancock's bright, detailed illustrations combined with informative and friendly text, provide children with an entertaining insight into life long ago. 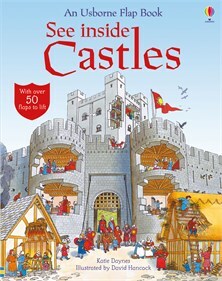 The Usborne 'See Inside' series is fantastic and 'See Inside Castles' is no exception. My son is 7, and just learning about castles as his topic at school. This book was a great introduction to castles in history, and it helped him to understand how the structures progressed from wooden structures, to fortified stone castles.